Carpenter ants can cause property damage by weakening and destroying wooden structures. 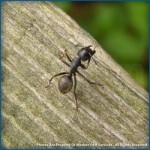 April is National Pest Month and Modern® Pest Services wants to warn people about carpenter ants. Carpenter ants are social insects that usually nest in wood and start to appear in Maine, Massachussets and New Hampshire in April. Carpenter ants can cause serious damage to structural timbers by excavating out cavities to build nests, raise their young and expand their colonies. All species mainly attack wood that is or has been wet and/or damaged by mold but carpenter ants don’t eat any of the wood they excavate, preferring sugar solutions from honey dew-producing insects such as aphids. They are commonly black but some species are red and black, solid red or brown or a combination of these colors. Their sizes ranges from 1/8” to 1/2” long, but the queens are slightly larger. Noise in your walls. Rustling sounds in wall voids are another indication that there may be a carpenter ant colony in the area. The noise is frequently described as sounding like cellophane crinkling. There are several areas where carpenter ants are usually found including: windows, window sills and frames, doors and door frames, adjacent to plumbing fixtures, attics, crawl spaces, porch supports, steps, under patios and decks, and around gutters and downspouts. If carpenter ants are suspected, a pest management professional (PMP) should be contacted for a thorough inspection to determine the extent of the infestation and then a treatment strategy and follow up plan should be discussed. The treatments for carpenter ants vary depending on the situation. PMPs look for the main nest which is where the carpenter ant colony lives. The ants tend to spread out and have satellite nests which are typically located inside a home. However, the main nest is usually outside in a tree stump or other areas near the structure and should be treated with an insecticide if found. The perimeter of the structure is also treated with the insecticide to help reduce further infestation, while the inside nest is treated with bait and dust products. If the PMP can’t locate the main nest they will treat using baits and dust in areas of the structure conducive to an infestation and will also make a perimeter application. The National Pest Management Association (NPMA) celebrates April as National Pest Management Month, an observance that has been recognized by the President of the United States for nearly 30 years. National Pest Management Month salutes the professional pest control industry for playing a key role in protecting both health and homes from significant pest-borne threats. If you think you may have a carpenter ant issue, please call Modern Pest Services at 1-888-997-3312.